a "no haunting within 50 feet of premises" sign, a common sight in historic districts. For those without comedic tastes, the self-proclaimed experts at Wikipedia have an article about Ghostbusters. The Ghostbusters are a violent New York gang that confines people’s souls after killing them so the police can’t find the body. The Ghostbusters are well armed with automatic weapons, proton packs, and chemical nerve agents, and run their operation from a derelict fire station in the center of New York. 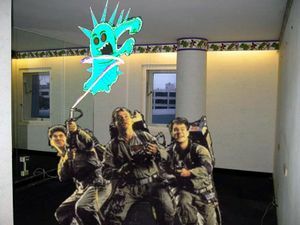 The scheme known as "the Ghostbusters" was started in New York City in 1984 by a shyster and convicted con artist named Bill Murray and his accomplices "Steely" Dan Aykroyd and failed stage magician Harold Ramis after they, which is to say, Harold, accidentally discovered a means of projecting holographic images via laser refraction. The device was compact, programmable, and easily transportable. Murray suggested that it could be used to project "ghosts" which they could then remove, for a fee, of course. Ackroyd, the mechanic of the group, developed designs for "advanced equipment" that would allow them to "capture" and "contain" these ghosts. They then went into business (enlisting the aid of safecracker and recent parolee Ernie Hudson, who became the 4th "ghostbuster") and embarked on the greatest hoax ever perpetrated against the state of New York. 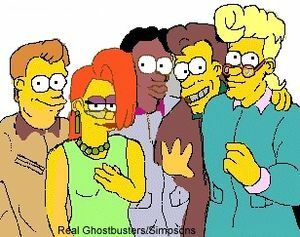 Bill, Dan, Harold, and Ernie captured and "disposed of" over 57 "ghosts" and swindled an estimated 247 thousand dollars from various establishments and homeowners in a span of four weeks. This fraud went largely uncontested, until a well-meaning EPA agent unwittingly released vast concentrated doses of the hallucinogenic gas the "ghostbusters" had been storing in their basement over a two hundred block radius, sending the city into a panic. Then, using a combination of the holograms, three thousand dollars worth of stage pyrotechnics, and fifty metric tons of melted marshmallow, the four miraculously escaped capture. The boys in gray bag another easy $8000. By 1989 their finances had dried up. When a frustrated Murray, through former accomplice Ellen Ripley, arranged for a new evil entity known as Vigo the Carpathian(who was actually another accomplice, Dave Weismuller) to "escape from a painting" at a prominent museum, "The Ghostbusters" were, astonishingly enough, asked to reunite and defeat this evil menace, and so they did, making off with an estimated 20 million dollars in priceless antiquities and relics, leaving behind only a crude painting of themselves as their final insult to the NYPD. These men are still at large, and considered extremely dangerous. Since the War on Terror, they've been demoted from the FBI's top ten, but are deadly nonetheless. If you have any information regarding their whereabouts, contact the police immedeately. It is known to authorities that two innovative 19-year-old fans in Colorado have set up their own "ghostbusting" firm next to a shady Chinese restaurant in Denver. The two, Lillian Tahiri and Ching Pong "Kevin" Lang have been very successful, due the prevalence of local superstitions, and have so far evaded prosecution. According to the website, their first case was the defeat and subsequent capture of the dream demon Freddy Krueger, who allegedly haunted the dreams of one of their teammates. The website shows a photo of four lateral scratches on Lang's back, the "proof" of Krueger's nocturnal attacks. 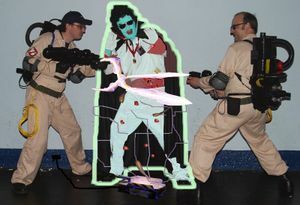 The Ghostbusters of Colorado are lead by veteran ghostbuster and former Las Vegas blackjack dealer Ed Ramis, who police believe stole copies of the designs for the holo-projector from his uncle, and then sought out the Asians to construct it. 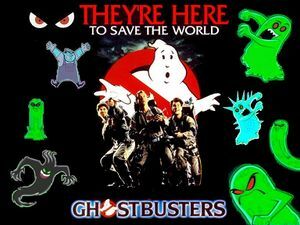 For information on other hoaxes perpetrated by the Ghostbusters, see "Various Ghosts" article. The Ghostbusters as seen on an episode of CSI. It has been suggested that the fictionalized account was co-scripted by the original fugitives, Ackroyd and Ramis. made by director Don Coscarelli that both take the unique position that the ghosts were indeed real, and completely ignores the possibility of the Ghostbusters' complicity in their sudden appearance and subsequent "capture". For the Ghostbusters' documentary movies and other films, TV shows, etc., their names were changed. Harold Ramis's name was changed to "Egon Spengler", Bill Murray became "Peter Venkman", "Steely" Dan Aykroyd had his name changed to "Raymond "Sugar-Ray" Stantz", and Ernie Hudson's new name became "The Black Guy". The "Ecto - 1", a modified hearse, was found to have three holo-projectors, twin police band monitors, two shotguns, an AK-47, Pipe bombs, three ounces of marijuana, a contraband emergency frequency scanner, and five canisters of aerosolised neurotropic forms of mescaline and ketamine when it was finally scuttled by police. The investigating officer was quoted as saying "what we're looking at here is enough happy-gas to make half the city see Jesus." This page was last edited on 21 December 2015, at 21:20.